In the era of fake news it's worth remembering: the medium is the message. For example: psychological studies have shown that text that's hard to read is more likely to be deemed untrue. 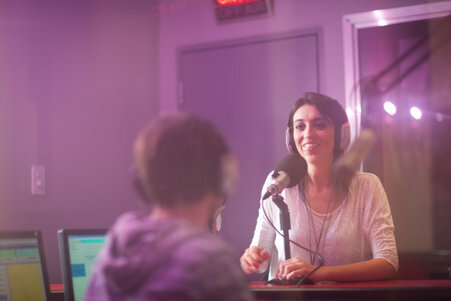 Now a study suggests that when radio shows interview guests over bad phone lines, listeners might discount the credibility of a speaker…and her work. "We find, over and over again, that the easier something is to process, the more likely you are to assume that it's true. And the more compelling you find it." Norbert Schwarz is a social and cognitive psychologist at the University of Southern California…who readily agreed to record himself in a higher quality format for this story than we’d get by recording his phone line. Schwarz and his collaborator Eryn Newman asked 99 volunteers to listen to an interview about genetics on the public radio program Science Friday. One recording was presented in normal phone quality: <<SciFri clip 1>>. But the other was tampered with, to cut its quality even more: <<SciFri clip 2>> Hard to hear, and less compelling. "In the condition where the audio quality is less good, same researcher—saying the exact same thing—it’s the same basic clip, is evaluated as being less qualified, being less good, being less convincing. And the message is assumed to reflect less important research. So basically, if your audio is not good, it hurts both your own credibility and the perceived quality of the research." Schwarz has obvious advice for audio producers, and their subjects: "Whenever you can, you should really try to get your interviewees at a good mic with a very good line. And as the interviewee it's really in your interest to look for a good connection." Here's one more reason to record higher quality interviews: volunteers were less likely to share lower-quality interviews on social media. A place where it's already hard enough to be heard above the noise.